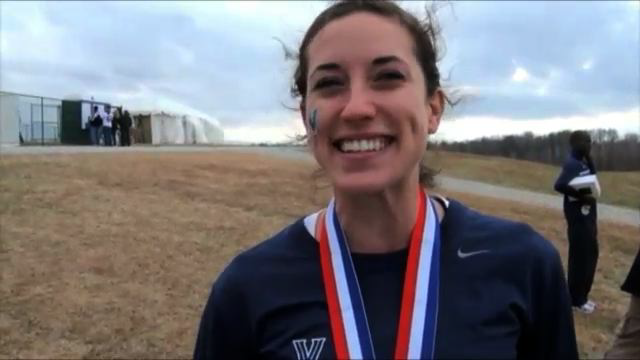 The Villanova women won their fourth consecutive Big East cross country championship today in Louisville, KY. It represented the women's 14th overall Big East XC title. Thanks to the 1-2 finish of Sheila Reid and Bogdana Mimic, and a strong overall team performance, Villanova was able to defeat three national top-10 teams in #7 Providence, #6 Georgetown, and #8 Syracuse. It wasn't easy, as Providence was only 9 total places off of Villanova's performance. One key to the team win was the performance of Callie Hogan, who came home ahead of the #5 runners from Providence, Georgetown and Syracuse and secured the victory. "It took a complete team effort for us to win today and that is exactly what happened," coach Gina Procaccio said. "Everyone had to set up for us and I am so proud of our runners for getting their job done. It was a great team effort and that is what makes this championship so fulfilling for us." Reid's victory was her third straight Big East individual cross country title. "We point to this meet in training and the team was ready to get the job done today," Procaccio said. "Winning a conference championship gives us great momentum moving forward into the next three weeks."